It's yet another case of Scandinavia beating the Americans at their own game. In fact take any genre of music you like and the Northern Europeans usually pick up on the trend, twist it into their own version which is often better technically and less tamed by record label interference. 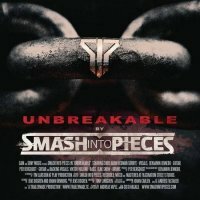 Thus it is with Smash Into Pieces from Sweden. Throwing into the mix a technically gifted version of the modern rock genre made popular by the likes of Creed, Alter Bridge and Christian rockers Red, Smash Into Pieces add their own distinctive guitar solos, keyboard fills and Scandinavian panache that gives the genre a well-judged kick up its collective back side. Album opener and first single 'Colder' twinkles with keyboards atop a huge riff and Chris Adam Hedman's powerhouse vocal roar; it's catchy yet powerful. 'Unbreakable' comes across as Sweden's answer to Alter Bridge with its Tremonti-like guitar histrionics and yet this album is far from plagiaristic. There are minimal screamed vocals and yet they add to the power of the songs such as 'Heroes (As We Are)' and 'Rockstar' rather than detract from the obvious melody inherent within. The atmospheric power ballad 'Come Along' shows that Smash Into Pieces isn't simply a one trick pony and the staccato heaviness of 'I Want You To Know' is both memorable and addictive. Three of the songs on 'Unbreakable' were first committed to disc in 2010 ('Crash And Burn', 'Here To Stay' and 'Rockstar') and appeared on the self-titled EP. However, don't be fooled into thinking that this album isn't worth buying, as the versions on this album have been rerecorded and sound like new songs in comparison. 'Unbreakable' really is an eye opener of an album and should put Smash Into Pieces onto the modern rock world stage. Up until now they've been Sweden's best kept secret; that secret is finally out.